Justice Minister Serraglio denies interference while two lobbyists linked to the PMDB party are arrested in Brasilia. 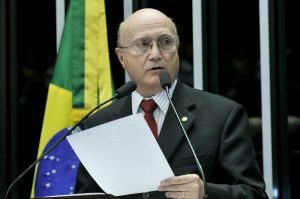 SÃO PAULO, BRAZIL – The new Justice Minister in Brazil, Osmar Serraglio has denied any intention to obstruct the Lava Jato (Carwash) investigations being conducted by the country’s federal police (PF). According to Serraglio his job and that of the PF are of a different nature and do not overlap. The new Justice Minister in Brazil, Osmar Serraglio has denied any intention to obstruct the Lava Jato (Carwash) investigations, photo Geraldo Magela/Agência Senado. The statement came hours before two lobbyists, accused of involvement in the corruption scheme arrived back in the country from the United States. “[There will be] no interruption in the Lava Jet. Our job is administrative. The Ministry of Justice does not interfere in the investigation of the Federal Police. It [the PF] is autonomous,” said Serraglio in a television interview to state-owned TV Brasil. Serraglio was appointed Justice Minister last week by Brazil’s President Michel Temer, after his predecessor, Alexandre de Moraes, left to occupy a seat in the country’s Supreme Court. Some critics of the appointment claim that the new cabinet member has strong ties with disgraced Congressional representative, Eduardo Cunha, and PMDB politicians, many of whom are being investigated or have been named in plea bargaining documents related to the Lava Jato mega corruption scandal. Father and son, Jorge and Bruno Luz, two lobbyists linked to President Temer’s PMDB party, were arrested as they landed in Brasilia on Saturday, coming from Miami. The two are accused of corruption and money laundering. According to the Federal Prosecutor’s Office (MPF), the lobbyists’ actions during the past 10 years have led to R$40 million worth of bribes being paid to Petrobras officials and politicians for the purchase of sonar ships used by the oil giant in its exploration of the Brazilian coastline. Prosecutors state that the father and son team lobbied members of Petrobras’ International Board, an area with great PMDB influence. Last Thursday the PMDB party issued a statement stating that the financial operators ‘have no relation to the party and were never allowed’ to speak in the name of the party.